Welcome To The Next Generation of Induction Technology! Our follow up to Mr. 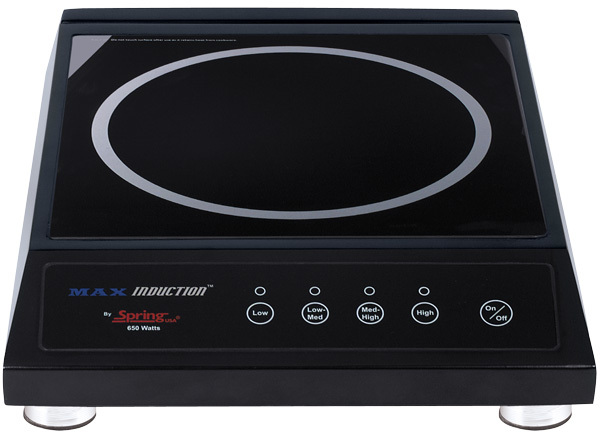 Induction, MAX Induction® features a tempered, smoked-glass faceplate, easy to read LCD panel readout with heavy-duty, knurled knob. Control touch-pad for operating in ‘Cook’ or ‘Temp’ modes. Durable, brushed satin, stainless steel body housing has a built-in air deflector. Reinforced, tempered glass surface and SmartScan® technology with increased efficiency. 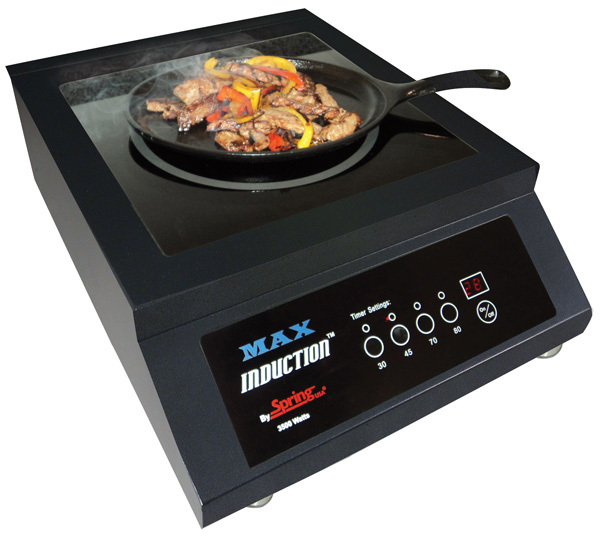 Induction range features leveling leg design with non-skid, non-scratch base. Spring USA MAX Induction® Ranges won’t automatically default, or reset their temperature once a pan is moved or removed. Other ranges on the market reset automatically, once a pan is moved or removed. For unit measurements/dimensions or power requirements, please see the individual Specification Sheets shown on our website, under the ‘Support’ Section. Thermostatic controls for ideal temperature settings. Value priced, with the same Spring USA quality you’ve come to rely on! Range features black plastic knob and footing and is priced to make it an easy addition to your facility. Range can be used as a cooking range, or for a hold-only applications. Our MAX Induction®, Portable, Hold-Only, ‘Stealth’ Induction Warmer has been designed to blend seamlessly with your tabletop or buffet. Designed as a HOLD-ONLY range, it is the perfect warmer for almost any venue. Its titanium coated body will not show fingerprints, and works perfectly for a portable tabletop buffet, appetizers at the check-in counter, or for use in Suites/Lounges. Unit is an energy-saving, 650 Watts of power. An exciting new look for front-of-the-house action stations! 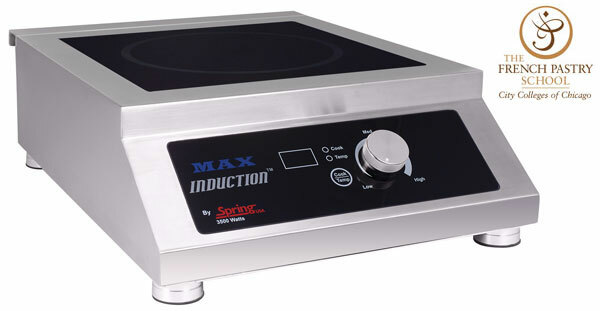 Our MAX Induction®, Portable, ‘Stealth’ Induction Range has been designed to blend seamlessly with your tabletop or buffet. Durable, stick-resistant, titanium finish on stainless steel ~ Easy to clean, and won’t show fingerprints! Use this model range for Cook or Hold applications. One range offers you dual functionality. Spring USA offers over 20 years of induction range technology experience. 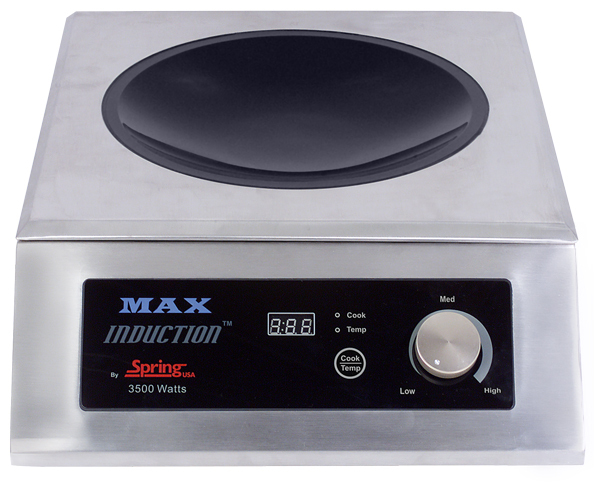 Our MAX Induction®, Countertop, Portable, ‘Sizzle’ Induction Range has four pre-set touch controls. The pre-set controls take out the guess work and ensure that your fajitas or desserts come out perfect, every time! Timer countdowns set to 30, 45, 70 and 80 seconds. Unit features a durable, easy to clean, titanium, stainless steel housing and chassis, with tempered glass cook top and integrated oversized pan support. 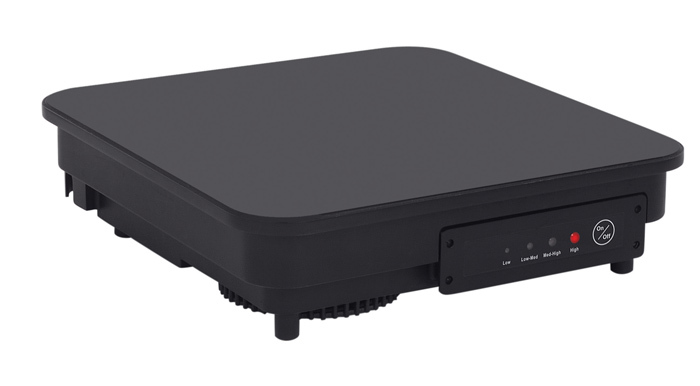 Range features our exclusive Spring USA SmartScan® technology with over/under voltage protection, pan size and pan type recognition, large LED power/temp display. 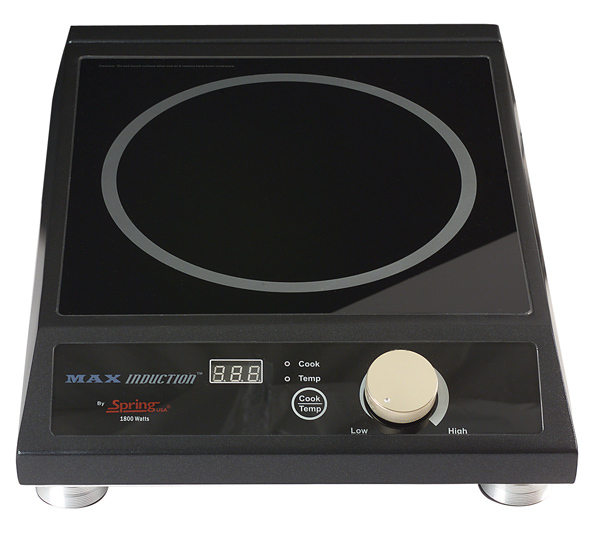 Our MAX Induction®, Countertop, Portable, Wok Induction Range features a hemispherical shaped coil & tempered, smoked black, heavy duty, glass-ceramic bowl. Removable face plate is adaptable for built-in application. Designed to give Chefs fast, powerful, precise temperatures to provide the best cooking results. Operates in ‘Cook’ or ‘Temp’ mode for reliable back-of-the-house or front-of-the-house cooking. Your MAX Induction Wok Range requires the use of induction-ready Wok Pans. Our Wok Pans have been designed and engineered specifically for use with our SM-351WCR Ranges. The hemispherical shape of these Wok Pans are specifically matched to the radius of the range glass and induction mechanism inside the range. See below, for product and Item # information. Our non-stick Wok pan has a 4 quart capacity and features a non-stick interior, and an 18/10 stainless steel exterior. This 5-ply stainless pan our Quantanium 3-ply, stick-resistant finish. This Wok pan has a 7 quart capacity and features a 5-ply stainless pan with rolled and sealed rim and comfort handle. It features an aluminum core for fast, even heat distribution.